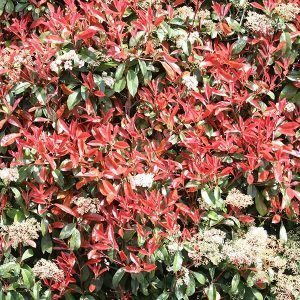 The species Photinia robusta with its red new foliage, has a number of varieties and hybrids that make it one of the more versatile hedging plants available. 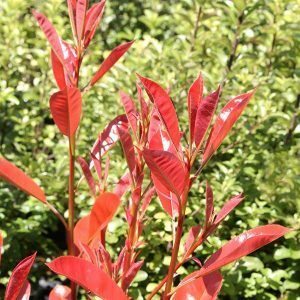 A fast growing evergreen shrub to small tree, used widely as a hedging or screening plant Photinia robusta has attractive foliage, emerging a nice red and turning to a deep glossy green. Flowers in summer are a creamy white but not significant, and a little unpleasant in fragrance. This is a very hardy plant for hedging and widely used in landscaping for these qualities. Fast growth rate and ability to grow in a range of soil conditions. New red growth is attractive. With a very dense growth habit, Photinia robusta is used widely as a hedging plant. Perhaps underused a small tree, where the red foliage is a feature in spring. Space Photinia robusta at around 2.5 metres apart for a good dense hedge. Growing well in full sun to part shade this is a versatile hedging plant that can be allowed to reach 3m+ or pruned to lower height in a more formal style if required. Dense foliage is an attraction when used as a screening plant. With removal of lower growth can also be used as a small shade tree. When planting, dig over the soil well and amend with compost if needed. New plants should be watered in well and then mulched to maintain a cool root run. Use a general purpose organic fertiliser in spring to help promote strong growth. Once established, use less fertiliser and less water to slow the growth rate. Prune regularly from an early age to promote a good bushy habit. 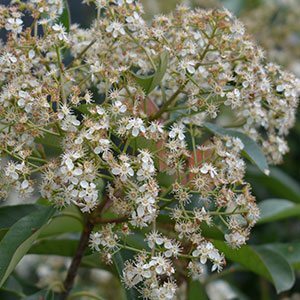 Height – Over time Photinia robusta will reach 8 metres in height, however usually pruned to around 3m. Spread – To 6 -8 metres over time. Growth rate – Fast. 3 -4 metres in four years is not uncommon in good soils. Soil – Tolerant of a range of soil conditions as long as drainage is good. Faster growth in good soils. Heavy clay soils with poor drainage are not suitable. Do not mulch to close to the trunk can cause problems.